Maris McKay has read 33 of 55 books. Maris McKay read 74 books of her goal of 50! Maris McKay read 55 books of her goal of 50! Maris McKay read 58 books of her goal of 55! Maris McKay read 53 books of her goal of 50! 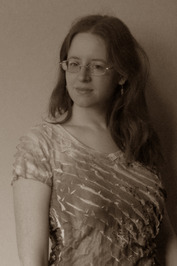 Maris McKay is a dreamer, writer, and full-time nerd with a passion for speculative fiction. She lives in Ohio with a neurotic cat who loves the smell of old books. To ask Maris McKay questions, please sign up. Maris McKay The name "Sanjay" popped into my head one evening, but I wasn't sure what kind of story he belonged in. When I tried writing about him, I ended up…moreThe name "Sanjay" popped into my head one evening, but I wasn't sure what kind of story he belonged in. When I tried writing about him, I ended up writing about his love interest (a story that's not in this book) and then his mother Daressa. Shortly after that came the idea of writing other women's stories set in the same world. Catiann's story was inspired by watching "The Last Kingdom." Lelithatha's story was inspired by the Celtic Thunder song "Midnight Well." I had a dream which prompted Zeila's story, though the current version bears no resemblance to the original idea. I don't remember what inspired Rivkah's story, though the scene with Verad and his men at her house is a nod to Tolkien's "The Hobbit." Feiyan's story grew out of my "what if?" musings on slavery in Chliang. Ari's story began as daydreams about Captain Hook from Once Upon A Time. Don't judge. The first version of Metim's story was as a response to a short story prompt. The original had a gnome that took an arrow to the knee. You ever type out a writing prompt, stare at it, and wonder, “What the heck is going on there?” And of course you’re a writer so you have the power to answer that question in the next story you write, but instead of doing that you just sit there and wonder. I really don't think it's too controversial to say that, even amidst a throng of other characters that got the short end of the stick, Padmé got the shortest short end of the stick in the prequels. We’d love your help. Let us know what’s wrong with this preview of Pirates of New England by Gail Selinger. We’d love your help. Let us know what’s wrong with this preview of The Road Back to You by Ian Morgan Cron. We’d love your help. Let us know what’s wrong with this preview of Emotional First Aid by Guy Winch.